We have all heard the now-famous story of the 1914 Christmas Truce. At this time of year we reflect on our ancestors who fought in the Great War and we commemorate their wartime sacrifices with services, cards, advertising and their tenuous 1914 Christmas celebrations, 100 years on. The following two newspaper stories, relevant to the people of Beccles, were printed in the East Suffolk Gazette in early January 1915. BECCLES MEN FIGHTING THE TURKS: Mr. W G Money of Beccles, has received a letter from several of the men of Beccles who form part of the Indian Expeditionary Force, with an enclosure in which they say:- "having heard in various ways that you would like to receive letters from men of Beccles who are in the army, we the undersigned are sending this letter thinking that our towns people would like to know where all Beccles men on active service are fighting. There are ten of us serving with the above expeditionary force, and in the same regiment operating somewhere in Asia Minor against the Turks. Having seen in the back numbers of your by as much esteemed paper that several of our old school chums have been wounded and in one case killed in Europe, we would like to offer our sympathies to them and their relations." "We paraded this morning at 5 am and everyone was presented with a card from their Majesties. I found a large ruined farmhouse and about 50 of us turned in and made things comfortable. Someone had obtained some fowls and a joint of meat. I found an oven, like those old fashioned ones in the country round St Andrews, I heated it and hired some crockery from the village cafe, bought beer and a tablecloth etc. The dinner was in the open, with snow on the ground - a typical Christmas Dinner at the front. I have had the great pleasure of sleeping in a bed in an old lady’s cottage for this last two days - there are three of us here - and I can tell you we appreciate it very much, especially as we have had the chance of a bath and general clean up. I had Christmas pudding heated up in the cottage I’m sleeping in -- invited a few chums in, and enjoyed it very much." I would like to take this opportunity to wish all my regular readers and all Becclesians a very Merry Christmas and a joyous New Year. I will be back in 2015 with more blog posts and historical anecdotes on the town. 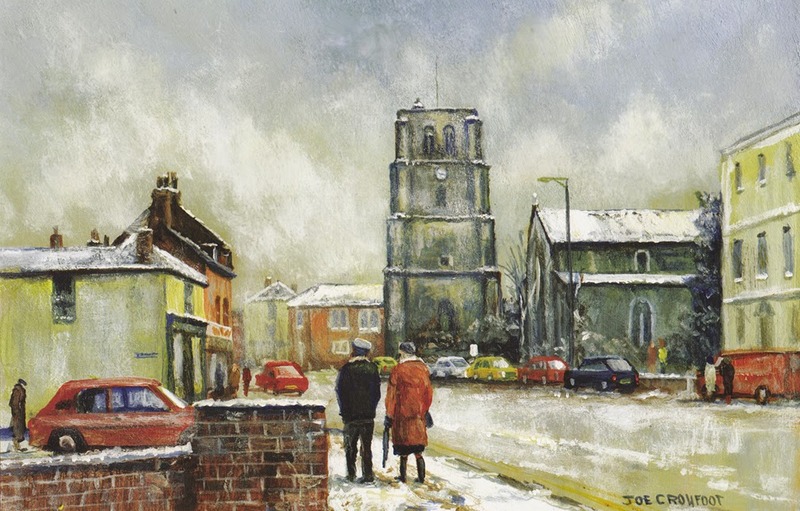 The following image has been taken from the 2008 Beccles calendar and is a painting by the wonderful Beccles artist, Joe Crowfoot. I visited his home in 2007 to purchase some of his paintings and works and I still have them today. He is my favourite local artist and this is a particular favourite painting of mine.